The McDonough GA fence experts at Natural Enclosures Fence Company have opened a new store where Do-It-Yourselfers and fence contractors can purchase fencing materials for their projects. Now Natural Enclosures can supply our customers with the same high quality fencing materials we use, for their projects. The McDonough GA fence experts at Natural Enclosures Fence Company have opened a new store where Do-It-Yourselfers and fence contractors can purchase fencing materials for their projects. The new Natural Enclosures store is located at 101 Jonesboro Road, McDonough, GA 30253 and is open Monday through Friday 8am-5pm. Their large warehouse facility allows Natural Enclosures to stock almost any type of fencing a customer may need for a project. At the store, customers can browse the store’s fencing samples to select the materials they need for their project. If a customer wants a fence installed, Natural Enclosures can install any type of fence including residential and commercial wood fencing, metal fences, ornamental fences and vinyl fences. They also install high security commercial fencing and automatic gate entry systems. In addition, Natural Enclosures can supply temporary fencing for business and organizational requirements. Other Natural Enclosures products include residential estate gates and swimming pool fencing. When possible, the company refurbishes wood fences to give them a "like new look" without having to be replaced, which saves property owners money and makes their property look great, however sometimes a customer just needs a new fence. 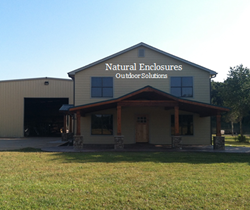 Now with their new store and warehouse, Natural Enclosures can fulfill any customer’s fencing needs whether they are a residential home owner who wants to install their own fence or a commercial fencing contractor who needs supplies for a job. The store’s large inventory of fencing products makes them the place for fencing materials for Atlanta, Stockbridge, McDonough, Newnan, Jonesboro, Peachtree City, Jackson, Fayetteville, Carrolton, Covington, Conyers and Lithonia GA.